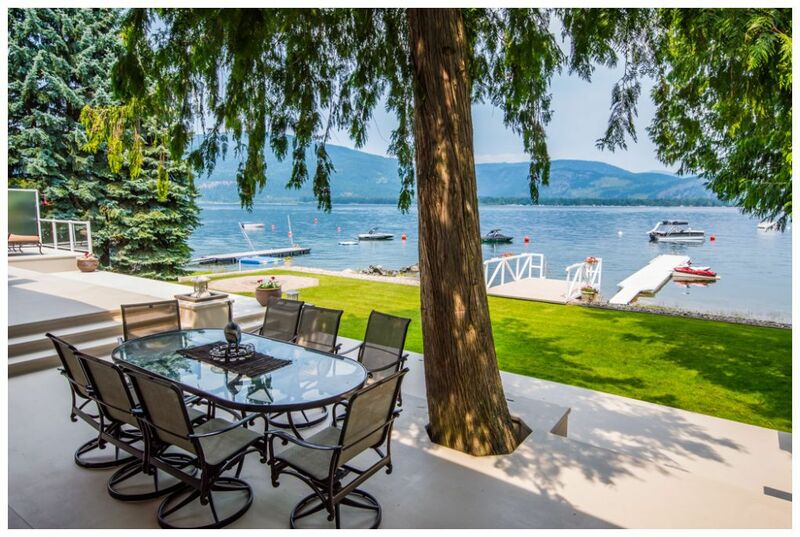 WATERFRONT Home on Shuswap Lake just 5 Kms West of Sorrento. Private 0.43 Acre property offers 110 Ft of lakefrontage & is ready to enjoy with most furnishings in/out included along with dock & buoys! This is a true Shuswap waterfront home that spans 2800 SqFt offering an expansive living area with wall to wall lakeview windows, vaulted wood ceilings with open beams, a central rock fireplace & rock wall feature that match the island bar in adjoining kitchen. Recent updates & well maintained, you will be impressed! Newer Roof, doors & windows. New electrical including panel update, New A/C, Hot water on demand. The bungalow plan boasts 4 full sized bedrms with murphy bed in one room that can double as a den & has its own gas FP & patio area. The lakeside master bedroom comes complete with ensuite & patio access & another corner gas FP. The home offers a second ensuite bedroom. The lakeside decks are massive for entertaining & include the hot tub & outdoor dining table with custom natural gas firepit feature that you'll love! There is also a wood firepit area, Allen block retaining/ break wall & high end floating dock. The oversized 4 car garage has a drive through bay with OH door to allow direct access to the beach. Surrounded by tall cedars & mature trees to ensure your privacy throughout the property! Professionally designed & decorated most furnishings, equipment & appliances are included.